We are specialists at hardwood floor cleaning in Lexington KY. Having a rough looking hardwood floor doesn’t always mean it needs to be totally refinished. Most of the time our process can bring them back to a nearly new state. The first step in the hardwood floor cleaning process is determining what type of hardwood floor that you have. Is it engineered flooring? Is it a laminate style? Once we know what type of hardwood flooring you have, we can get down to the business of cleaning it back to a like new state. We use a special process that breaks through the years of dirt and grime that’s built up over time. Removing this layer of build up can be challenging and getting it done right takes more than a mop or broom can handle. Our process removes unseen dirt and grime from all of the cracks and crevices found in typical wood flooring. After we professionally clean a hardwood floor we’re ready to make it shine. Like all things related to hardwood floor cleaning, the process will depend on the type of floor it is, to the species of wood that we’re dealing with. Also, will the floor have a satin look, or will it have a high gloss shine to it? All of these things are important and need to be addressed before the floor sealant or wax is applied. Some floors will need to be buffed with our electric buffing machines to achieve the shine that some wood floor species and finishes are designed to have. We are fully equipped with the latest machinery and tools to bring most any floor back to a near new condition. 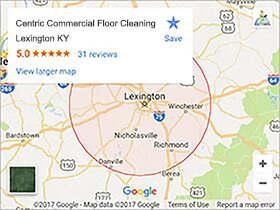 We’re not just limited to doing hardwood floor cleaning in Lexington KY. Our service area extends out from Lexington a full 30 miles in all directions. We clean hardwood floors in Georgetown, Richmond, Frankfort, Winchester, and Nicholasville KY. 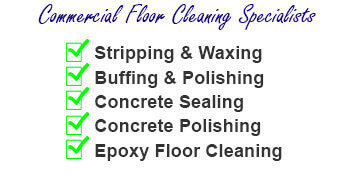 If you’re located in our service area we would love to hear from you about your next floor cleaning project! We clean a lot more than just hardwood floors and make it our focus to be able to tackle any commercial cleaning job that our clients may need. We take a lot of pride in offering one stop shopping for business owners when it comes to having a “go to cleaning company” that can do all of their cleaning in one go. Just grab the phone and call us today at 859-396-1718 or use our onsite CONTACT US FORM. 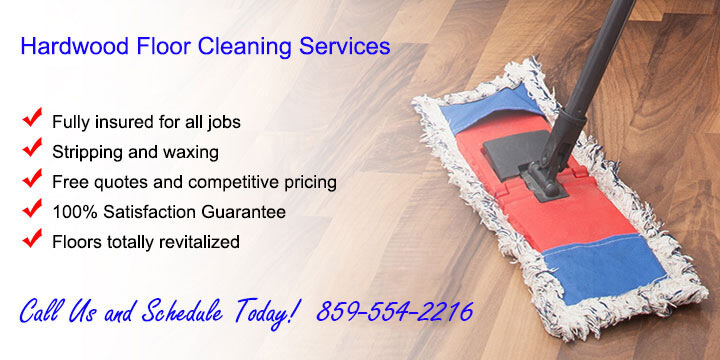 We’ll quote you fair and accurate pricing on any cleaning needs you have. Visit the National Wood Flooring Association website to learn more about our industry.